In December 2012 I visited Somerset House, London for an exhibition to what I thought was for Henri Cartier-Bresson. 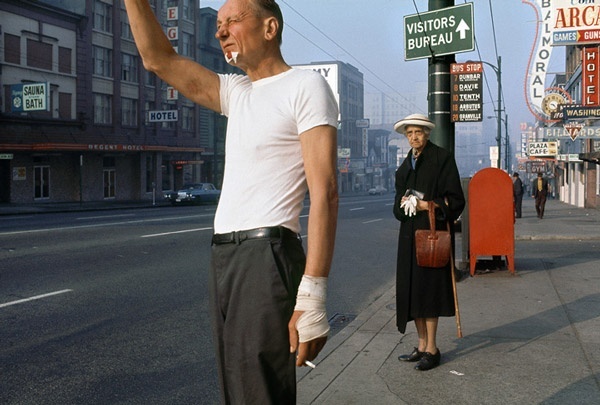 However when I arrived I discovered that although it did cover some of Henri’s work it also covered many of those that were inspired by his early images on what today is more commonly known as ‘Street Photography’. This I found to be the best of both worlds and an excellent exhibition for this new course on People and Place. The first image that I came across that I really liked was by Joel Meyerowitz [b. 1938] from his collection ‘Fort Lauderdale Florida 1968’. 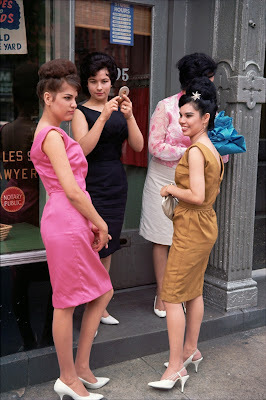 This has three great poses of young ladies from the sixties, only one looking directly at the camera, another looking moodily away and the third smiling. The colours are great here and the matching white stilettos bring the girls together in common fashion, the must have accessory for the late sixties. The framing of the image in a door way makes for an interesting location, one that is frequently used as if also putting the people in a box. The second image Fred Herzog [b. 1930] is widely known, entitled ‘Man with Bandage’ it is referenced in several books I have looked at. For me this image questions many things. Why is the man looking so shabby, not wearing a clean shirt, just his vest? Yet he has just shaved and cut himself more than once. His bandage may suggest he is accident prone, but he is not conscious of standing out in a crowd, with cigarette in hand. In contrast the lady behind him looks on apprehensively. She is well dressed and presented, obviously part of another era where presentation of oneself was viewed to be of great importance. Harry Gruyaert [b. 1941] had a couple of images on display, as did most artists. 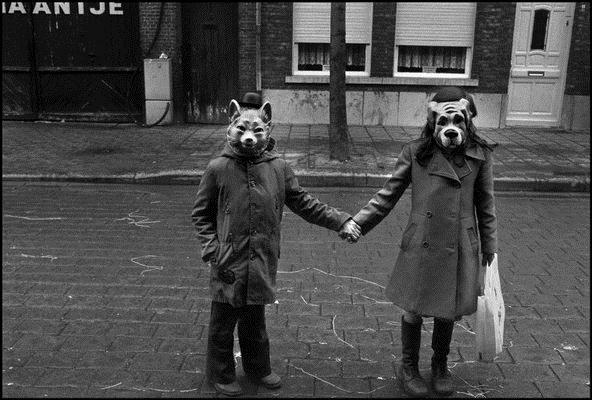 In this black and white image he captures the obscure portraits of two people wearing dog masks staring directly back at the camera suggesting that it is the viewer who is out of place and not the subject of the photograph. Strangely intimating that we do have an animal side to us and that we often disguise this or chose to ignore it. The fact that they are holding hands also suggests that animals too have relationships, echoes of ‘Animal Farm’ by George Orwell also come to my mind in viewing this image. 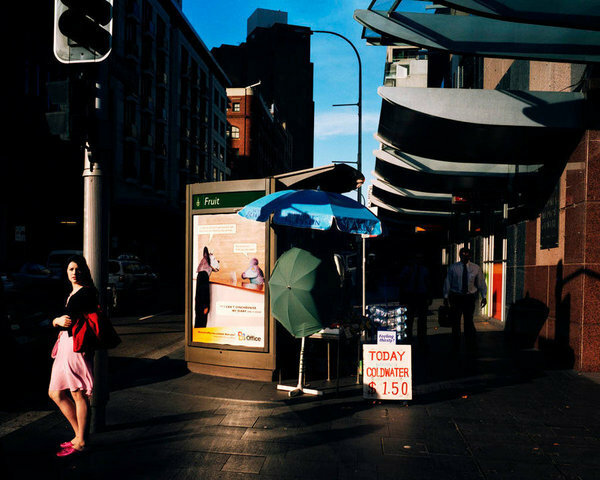 Finally Trent Parke [b. 1971] an Australian Photographer had the following image entitled ‘Today Cold Water’. The copy I found on the Internet does not do this one any justice in print but I was taken with this image's framing and colour, especially as most of Trent’s work in monochrome. The image has great balance with so much happening I wonder if this was staged or just one moment in time. The prominent signage, and title, being the focal point make me wonder what the price of water will be tomorrow?